Your front entry gives your guests their first impression of your home and some idea of what to expect inside. It welcomes your friends and family into your home, provides you with a distinct separation between the outside world and your inner sanctuary, and could be the envy of your neighbors — if you play your cards right. If you plan on selling your home at some point in the future, your front entry will play an important role when it comes to curb appeal and the first impression potential buyers have of your home. In fact, the front of your home, including the entry, is so important when it comes to potential home buyers that it could make the difference between whether or not they ever see the inside of your home in order to fall in love with it. Since most folks looking for homes drive by houses before scheduling appointments, that first impression is incredibly important. Of course, even if you never plan on selling your home, creating a striking front entry is a great home improvement project that is sure to impress your family members, friends, guests and neighbors. Here are nine ways you can improve your front entry and potentially increase the value of your home. 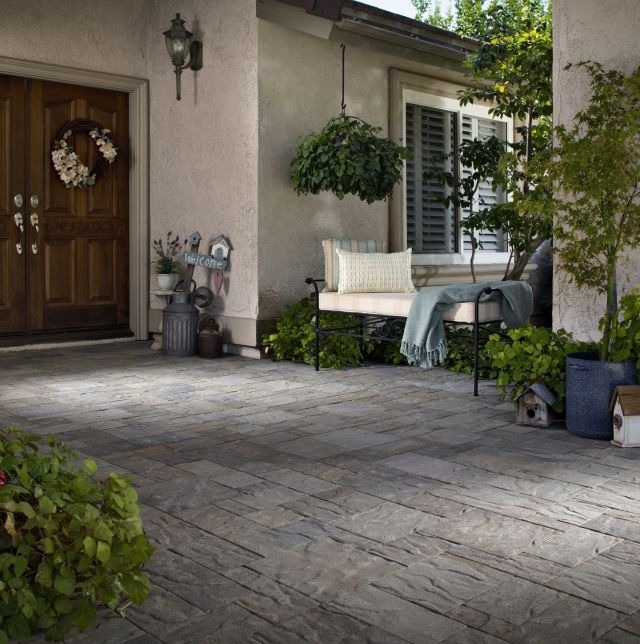 If your goal is to enhance your home’s curb appeal, increase your home’s value and improve the overall look of your entry, adding a paving stone patio is an easy way to accomplish all of this quickly. 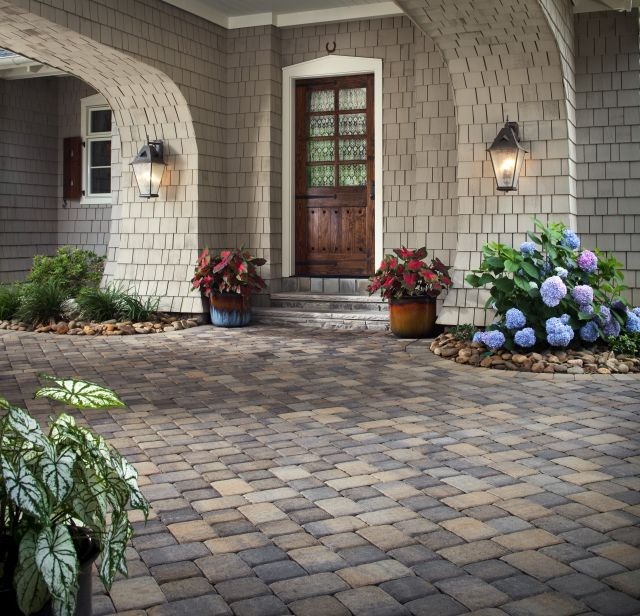 Installing a paver porch can immediately increase your home’s value and will instantly enhance the overall visual appeal of your property. 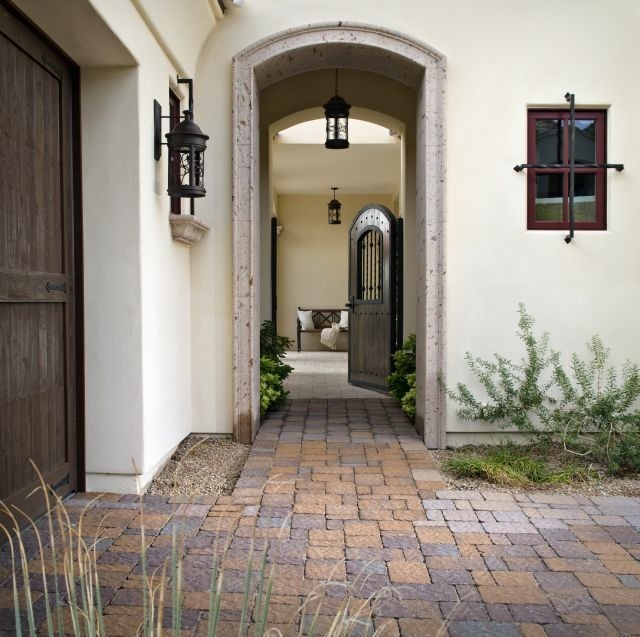 It is a great way to make your entry more inviting, and paving stones work well with all types of homes ranging from traditional to modern architectural styles. The variety of colors and shapes available allow you to customize your porch to suit your personal taste and needs, while the durability and slip-resistant quality make pavers a functional choice for active families. 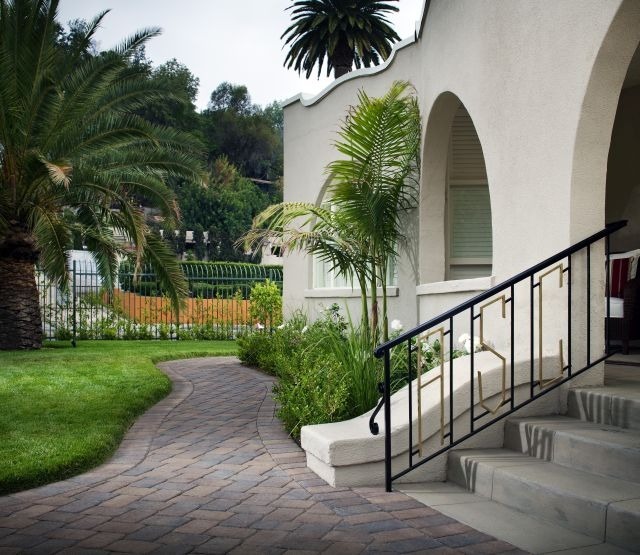 A paving stone walkway or paver stairs leading to your entry is another great way to instantly enhance the look of your home and increase its value. If you are installing a paving stone porch, this is a great opportunity to transform the front of your home further by also including a walkway made from pavers leading to your entry. Of course, if you are happy with your current porch, you can leave it as it is and create a walkway with paving stones in a color and style that complements your existing hardscape. If you have a front porch that is large enough to include a seating area, this is a great opportunity to create an outdoor living area and make your front yard more functional. Most of us do not spend much time in our front yards, aside from making sure they are weed free and providing an attractive first impression to our guests. Most of the outdoor living happens in the backyard. However, it does not have to be this way, and you can create a more welcoming front entry by creating a small seating area where guests can congregate or you can enjoy your morning coffee. Something as simple as a bistro set is enough to create an inviting seating area and is the perfect choice if your porch is small. Replacing your front door is a quick way to update your home’s facade and an easy way to make your entry more inviting. According to the Remodeling 2014 Cost vs. Value Report (www.costvsvalue.com), this may be a particularly good choice of home improvement projects for those of us living in the San Diego area. This report shows that front door replacement in San Diego has a comparatively higher return on investment than the same home improvement across the Pacific region or across the country. A mid-range fiberglass entry door replacement has an estimated cost of $2,971 and a resale value of $2,912, which is a return of 98%. That is not bad for a home improvement project you would probably want to do regardless of the return on your investment. If you opt for a mid-range steel entry door replacement, which has an estimated cost of $1,305 and resale value of $1,529, this report shows that you could be looking at a 117.2% return on your investment, which is even more appealing. Front doors can be found in just about every color now, and painting your front door a color that complements — but is completely different than — your home’s other colors is quite the growing trend. You can base your color choice on feng shui principles and the direction your door faces, your personal style, the impression you want to give guests and passersby, or psychological concepts of how color affects mood and perception. However you choose the color for your door, this is an affordable, simple home improvement project that you can do on your own and complete in one session. If you take your door off of the hinges to paint it, you will likely want to call in a professional to ensure that it is hung properly, but if you leave it on, you should be able to complete this project on your own. While you are changing the color of your door, you might also want to consider updating — or upgrading — your door handles to improve the look of your door even more. Repainting the trim around your front door and windows is one of the easiest and most affordable ways to refresh the facade of your home. Choosing a color that closely matches the current color of your trim will make the job quicker and your life easier, but changing up the color can bring a whole new look to your home. If you have peeling or chipped paint, be sure to scrape and sand the trim first so that your new coat of paint will go on smoothly and have an attractive appearance. While you can certainly refresh the look of your home by just painting the trim, you might want to consider also repainting fascia, porch railings or other features of your home. The garage door might not be the first thing you think of when you consider ways to improve the look of your front entry but, on most houses, it is one of the first things that guests see. Interestingly, a recent study shows that replacing your garage door also has a good return on investment. According to the Remodeling 2014 Cost vs Value Report (www.costvsvalue.com), a mid-range garage door replacement in San Diego will cost you about $1,745 and adds a resale value of $2,042. This is a surprisingly impressive return of 117% on your investment. An upscale garage door replacement in San Diego is estimated to cost approximately $3,047 and have a resale value of $3,705, which is an even more impressive 121.6% return on the initial investment. If your garage door is relatively new or in pretty good shape, you should probably focus your home improvement efforts elsewhere, but if it has seen better days, this might be a front entry enhancement well worth undertaking. If your goal is to completely change the look of your front entry, you can definitely achieve this by creating a courtyard. A courtyard, which is a walled outdoor living space, can be created simply by adding a garden wall to enclose your entry. You can do this with a taller wall for greater privacy, or with a paving stone sitting wall for the look of a courtyard without making the space feel too small. Once enclosed, you can choose to decorate the courtyard in the style of an early California hacienda, an Italian villa or a French country home. If you do not have a mud room, a walled courtyard can serve both purposes to provide more function for your family. While you may not have wanted to install a bench of shoe cubbies when your entry was open to the street, now that you have a walled courtyard, you might feel more inclined to create a space that is both functional and attractive. Creating a courtyard is also a great way to make an outdoor living space in your front yard that will still feel like it has the privacy of your backyard entertaining areas. Water features are falling a little out of fashion in light of our ongoing drought, and at least a few of your friends will probably look askance if you still have your fountains bubbling or waterfalls flowing in your landscaping features. However, you can still enjoy the look of water features without the water. Waterless water fountains are beautiful on their own and can be used in a similar manner to statuary in your landscaping. You can also add potting soil and succulents to create an attractive planter, or grow herbs that you can use in your kitchen. If you choose to create a courtyard around your front entry, a fountain will make a particularly appropriate addition. 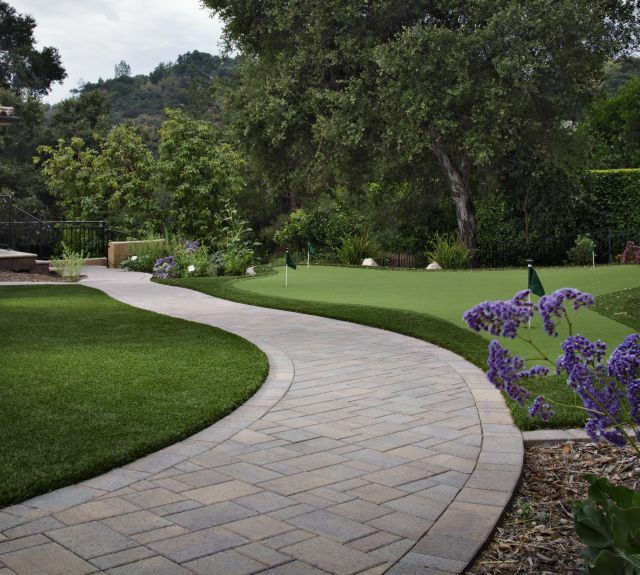 You can also create the look and feel of a water feature by including a dry creek bed along your walkway or elsewhere in your landscaping. What improvements have you made to your front entry?